Like other summer squashes, zucchini is a healthy and flavorful vegetable that you can add to all different kinds of dishes. Use it in a pasta sauce, add it to a stir-fry or bake it into sweet loaves of quick bread. You should eat zucchini with the rind attached whenever possible, since the rind contains much of the nutritional value. Because zucchini has such a high water content, it's very low in calories. One medium raw zucchini with its skin on contains just 31 calories. That same zucchini contains no fat and cholesterol. If you're trying to cut down on calories, fat or cholesterol, zucchini is an excellent choice. One medium raw zucchini with its skin delivers just 7 grams of carbohydrates. Of these carbohydrates, 2 grams are from dietary fiber, accounting for 9 percent of your recommended daily value of fiber. Another 3 grams are from sugars. The zucchini also contains 2 grams of protein. When you eat zucchini, therefore, you benefit from both its fiber and its protein. One raw medium zucchini, including its skin, boasts 56 percent of your daily recommended value of vitamin C. It also delivers 11 percent of your daily value of vitamin K, 16 percent of riboflavin, 21 percent of vitamin B-6 and 14 percent of folate. Other vitamins present in lesser quantities include vitamin A, vitamin E, thiamin, niacin and pantothenic acid. This green summer squash is especially rich in the minerals potassium and manganese. One medium raw zucchini, including skin, delivers 15 percent of your recommended daily value of potassium and 17 percent of manganese. It has 8 percent of your daily value of magnesium, 7 percent of phosphorus, 5 percent of copper, and smaller amounts of calcium, iron, sodium, zinc and selenium. 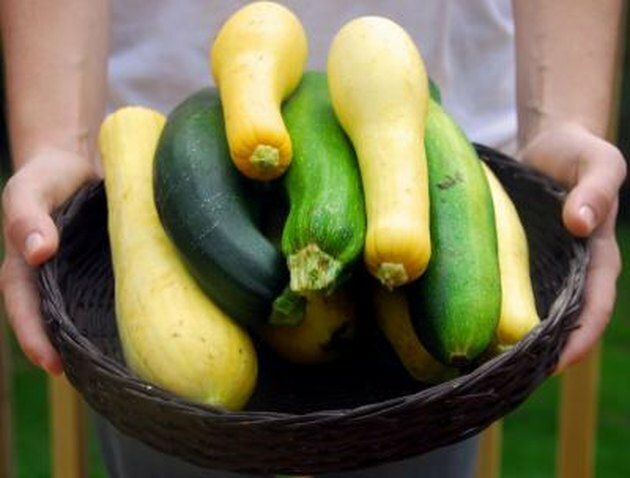 Zucchini are available year-round in the United States, but are especially plentiful in summer. The CDC recommends selecting squash that feel relatively heavy for their size; this indicates that the interior texture is good. The skin should be glossy, bright and firm. If you refrigerate fresh zucchini in plastic bags, you'll be able to keep it for about a week.